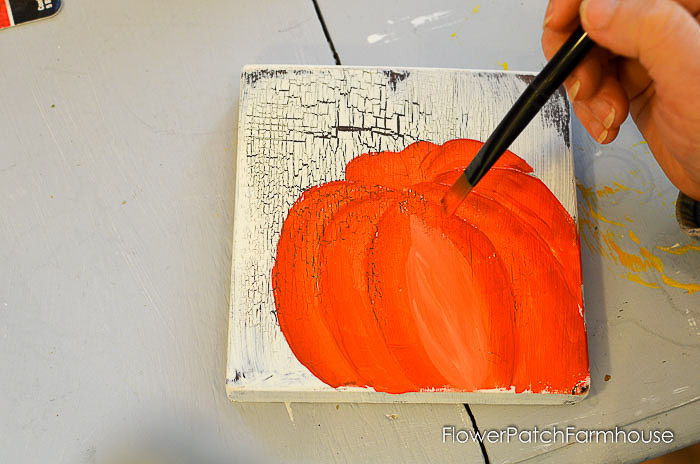 Let’s paint orange pumpkins in acrylics. Easy enough for beginners to feel successful the very first time. A free video is included. 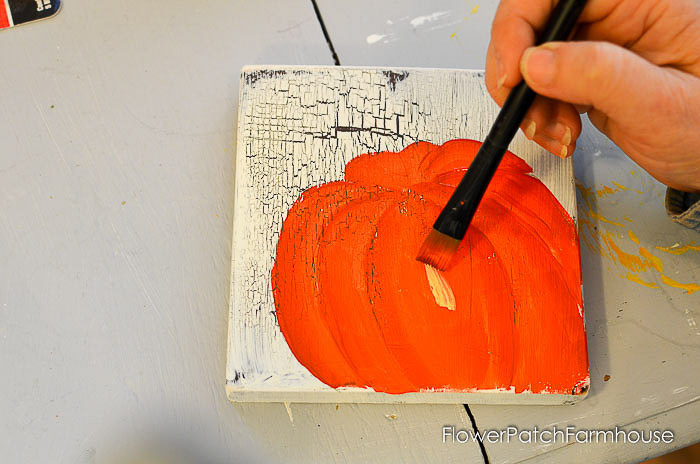 Fall is the time to paint orange pumpkins in acrylics on just about anything in decor. Really you can do this anytime of year but Autumn seems to be the time that pumpkins take center stage. 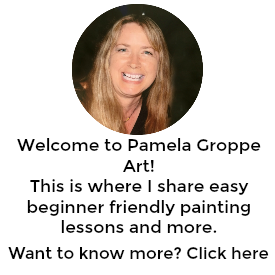 No time to view this now? PIN for later. 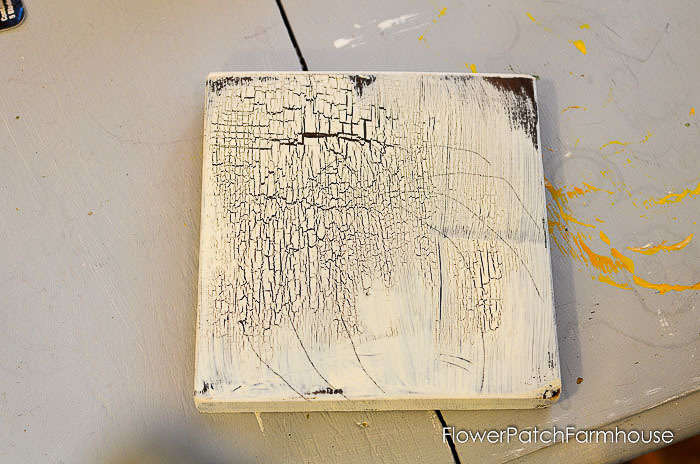 When I shared my Fall Scrabble Tile art I had a two sided tile in place of the A. 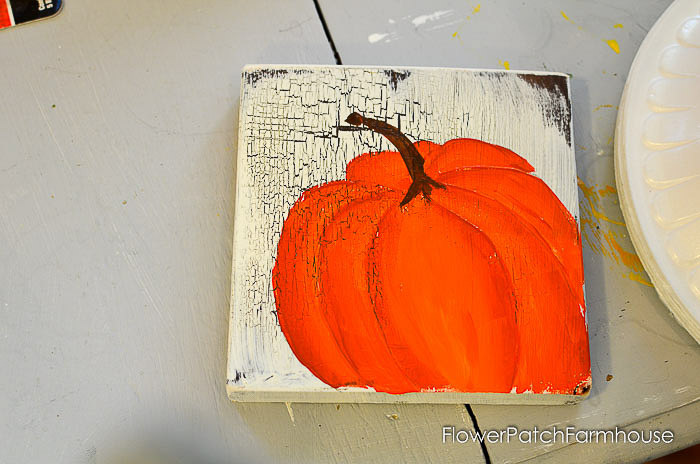 One side had a Fall Leaf painting and the other an Orange Pumpkin. One stroke brushes which include #12 Flat Brush. 6. Double load the #12 Flat brush with the Tangelo Orange and Georgia Clay. (see this post if you don’t know what double load means) Stroke the Georgia Clay side along the outside edges of the pumpkin ridges and the Tangelo Orange toward the center. 8. While the paint is still wet load some Banana Cream into the brush (do not clean the brush first), touch in and blend to create some highlighting. This will draw it forward creating dimension. 9. 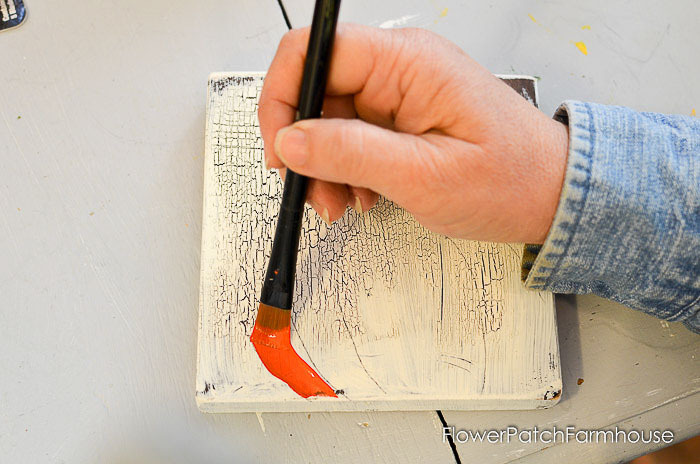 Clean the brush and squeeze dry with a soft cloth or paper towel. 10. Double load the brush with Banana Cream (Sunflower) and Burnt Umber. Stroke upwards to create the stem. 11. Finish with a matte or satin Varathane finish or you can also use a wax. I really like DecoArts Creme Wax finish. It glides on like butter and buffs out to a wonderful heirloom finish. And it has no harsh odor. In the video I show how to shadow around the outside edges and added a bit of white highlights but those are totally optional. As well as after taking a second look at this pumpkin I thought the stem too narrow. So in the video I show how I widen it and fix the base of it. Now you have a gorgeous orange pumpkin! I just finished a complete Pumpkin Leaf tutorial, go Here to see it! 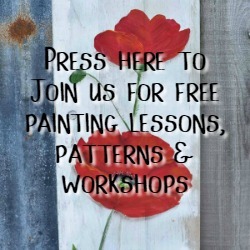 I used real pumpkin leaves to create the pattern. 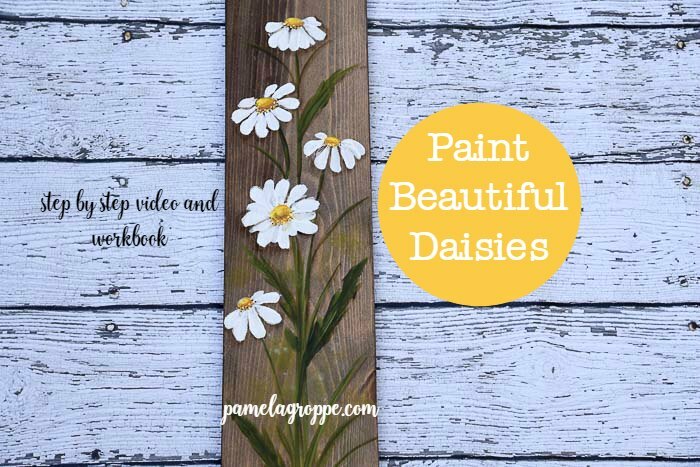 My latest step by step workbook that you can download and print is available or take the full on video lessons! Is there a stencil for the pumpkin? Do you mean a pattern? I should put one up. I will work on that and let you know. Thank you so much! I absolutely love your tutorials. They are very easy to follow. 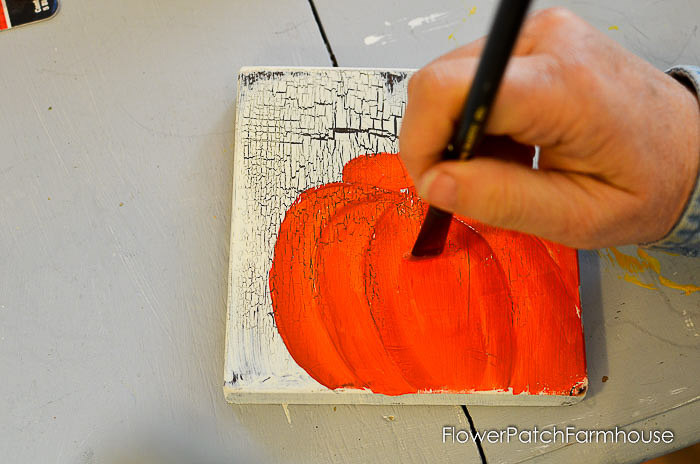 I am stuck on making leaves for my finished pumpkin paintings. 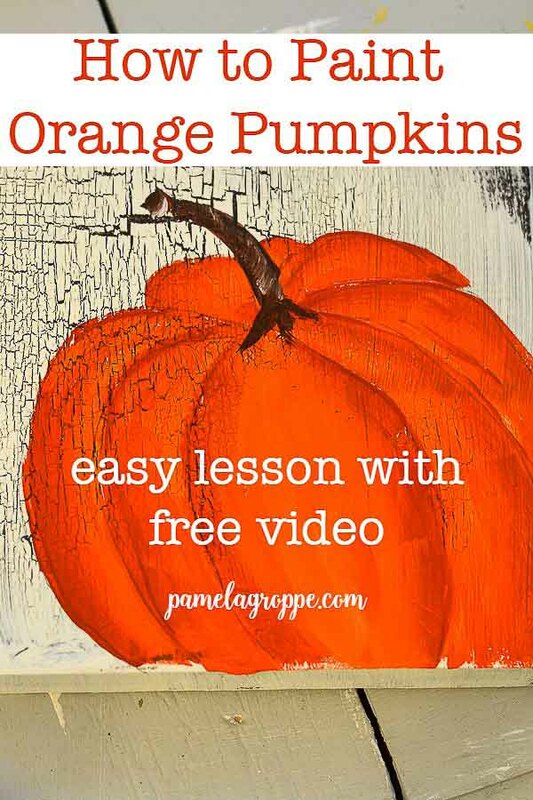 Can you do a video with a pumpkin with leaves? We’ll do. I will get on it ASAP.